For example, a ‘no deal’ Brexit would imply a shock equivalent to losing some 42,400 jobs in the parliamentary constituency of Cities of London and Westminster. However, 41,250 of these jobs are held by people who live elsewhere. At the other extreme, Streatham may suffer a loss equivalent to 650 of its jobs, but around 2,250 of Streatham’s residents would lose their employment. Our estimates are conservative. They suggest that failing to secure a close trading relationship with the EU will give the UK economy a shock equivalent to losing a total of about 750,000 jobs (only about half the value implied by the government’s own estimates of 28th November). We find that, while those job losses will tend to be concentrated in cities and large towns, the people whose jobs they are, tend to live over much larger surrounding areas. Presenting Brexit effects by area of residence is important because people typically spend more where they live than where they work. 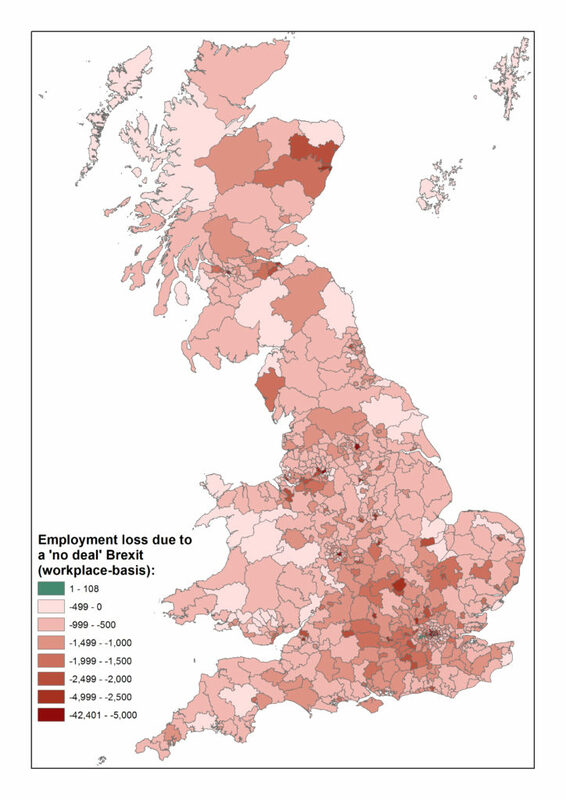 This means that the impact of Brexit on any constituency is captured more appropriately by studying the possible job losses among residents of that constituency rather than among workers in that constituency. Once we look at Brexit on a residence basis, we see that its economic costs are less concentrated but far more widespread than one would guess from the pattern of employment around the UK in terms of workplaces. While 269 constituencies will suffer shocks equivalent to losing more than one thousand jobs on a workplace-basis, 398 will do so on a residence-basis. Constituency-level results are particularly important at present because Parliament, and hence the views of individual MPs, will play a key role in making Brexit decisions as part of the imminent ‘meaningful vote’. Our results will help MPs and the people who vote for them to gauge, albeit approximately, one aspect of their economic interest in the outcome of Brexit. The complete set of results that measure the Brexit shock in terms of possible job losses among workplaces and residents of the 632 parliamentary constituencies in Great Britain, along with a more detailed discussion of them, is available is this note. We give results for a ‘no deal’ Brexit and a ‘soft’ Brexit which assumes that the UK maintains much closer links with the EU economy. This study is a follow-up to our recent analysis of the impact of Brexit on the 34 parliamentary constituencies in Hampshire and Sussex published on 21 November 2018. That publication explains exactly how the estimates are derived and how to interpret them. Brilliant! Yes, I do believe Prof Winters has the answer with this. I would suggest that a special effort is made to get a high turnout especially in the first referendum. I’m afraid that some remainers may feel it’s not for them (“plague on both your houses”) but if they don’t vote they could end up with a no-deal brexit. All three campaigns (Remain, May’s deal, and No deal) would campaign in parallel for their preferred options. Allocating spending limits would be tricky, as there’s no symmetry between the three options. Maybe in the proportion of, say, REMAIN £3m; DEAL £2m; NO DEAL? It could either be left to each campaign to decide how much of their allowance they hold back for the second referendum, or distinct spending limits could be set for each referendum. (I earlier suggested having both votes on the same day, on a single paper. There are some subtle advantages to this, but it would require THREE questions, and would, I think, on balance be too complicated). Is it possible that you could share how you acquired the data/estimates for the number of jobs affected?